You may have heard about Colorado's "first in time, first in right" rule regarding water rights. In the past, this approach meant that it was - with a few exceptions - not lawful to capture and store rainwater. Recent changes in the law mean that beginning August 10, when the measure goes into effect, Colorado residents will be able to legally collect rainwater within certain guidelines. The following guidelines provide a brief overview of the rules and restrictions for collecting rainwater. Single-family and multi-family homes (with no more than 4 units) can collect rainwater. You can only collect rainwater that comes from your roof. Rainwater can only be stored in rain barrels. You can have up to 2 rain barrels. Barrels must have a lid that can be sealed. Your rainwater collection system cannot hold more than 110 gallons of rainwater. You cannot use water you collect for indoor purposes (like drinking, bathing, etc.) or to water animals. Rainwater could include dangerous contaminants (from pollution and even your roofing materials). 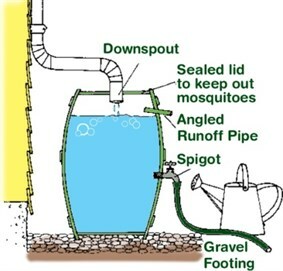 Mosquitoes lay their eggs in stagnant water and can transmit diseases; therefore, it is important that you regularly empty and clean your rain barrels. Mosquito management is an important pest control effort that everyone can engage in.